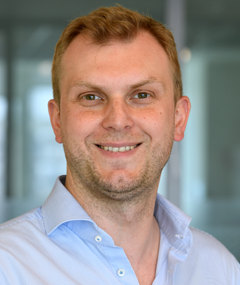 Łukasz is an experienced CIO with extensive experience in IT transformation and reorganization at Polpharma. His responsibilities at the largest producer of pharmaceutical products in Poland also include the development and implementation of IT strategies and models for business and IT governance, the management of the Shared Service Center at Polpharma and all issues relating to IT security. Łukasz focuses strongly on the support of his company’s business strategy – through a close business alignment of IT, with digital platforms for business and a strategic roadmap for digital transformation. Polpharma is the largest Polish manufacturer of pharmaceuticals and a leader of the Polish pharmaceutical market. The company actively operates in the markets of Central and Eastern Europe, the Caucasus and Central Asia. For over 80 years, they have been trusted by patients, healthcare professionals and business partners alike. Polpharma is among the top 20 generic drug manufacturers in the world – with more than 7,000 employees in Poland and on international markets. The company has 7 manufacturing plants in Poland, Russia and Kazakhstan, and 7 research and development centres. Polpharma Group’s portfolio includes about 600 products, and another 200 are being developed. It is one of the most innovative companies in Poland according to the ranking prepared by the Institute of Economic Sciences of the Polish Academy of Sciences (PAN). Polpharma contributes to scientific development and health education and promotion.